Chemical aspects of sweetness embrace molecular theories of chemoreception as well as simple structure: activity relationships of defined classes of sweetener. Chemical and physicochemical interactions probably affect both the quality and the intensity of sweet taste response, and the molecular structure of a selected sweetener will govern both its suitability and stability in a particular food system. 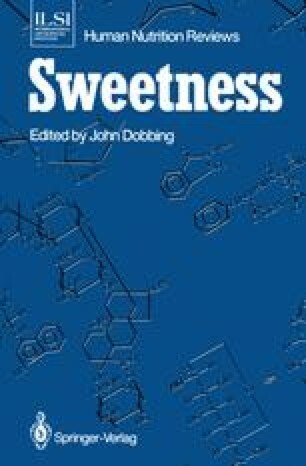 Much of the commercial interest in the subject of sweetness has centered on finding an alternative to sucrose with a view to matching its ideal taste properties and effort has concentrated on selected and/or modified sugars, proteins and peptides, flavonoids, glycosides, saccharin and acesulphame.